This is the first poem I ever put to a melody! I wrote it in an e-mail reply to a friend who was telling me he was always searching for some place to call home. I just responded with the first line of the poem and then wrote the rest right in that letter! It seemed to write itself. I got to thinking that I should be able to write a tune for it and this is what I came up with while on the bank of a peaceful river. 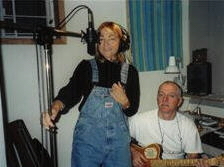 I played it for my brother-in-law, Bill Candy, a fine musician and songwriter, and he thought it was good enough to record in his studio. He played some different guitars, did some percussion, and sang harmony on the chorus. I was so thrilled! The whole process was so much fun! Thanks, Bill! I have a huge thanks to give Annelisa, my good blogger friend from England, for staying up all night to figure out how to get it on You-Tube! Here it is..hope you enjoy it! But from the soul within. And we wouldn’t pay the fee. We struggle with "beyond ourselves"
Of where we ought to stay. No, we wouldn’t pay the fee. Hey, what took you so long to get the song up, MOI!? :-D lol! Well, you look and sound fantastic, MOI! Well done you! Yeah, High five! I'll have to learn from you the tricks of uploading pics so that they're spaced nicely like you did here. Thanks so much! I think I heard someone whisper..."Bloscar"!! Gee what pair of jeans to wear??!! Another Song out there..Whats the hold up ladies? Mom, you do look and sound fantastic!!! Two people , half way round the world, putting something together in large part just for the fun and fellowship of it. Nicely done. I'm just overwhelmed. The Lyrics, the Melody, the Voice, hit my soul directly and gently, stroked my body and heart and gave me peace. The lyrics are so true. The melody so harmonious. The Voice so clear and emotional. Let the whole world listen. Learn it in school. Sing it churches. Everywhere where people meet. I'll bookmark this post and send the URL to friends and family. And post a link from my blog. Yay! You did it! I love this song every time I hear it. I couldnt believe I was actually hearing your voice!! Yay!!! you sound great. And that song rings soo.. true! simple and deep thoughts, moi! and just loved the video!! great job, annelisa!! Okay not really, but i am so impressed with you. I had no idea. This is lovely. And you can sing. Now i am jealous. Really lovely. I think you sound wonderful Mom, I love poems that just flow and write themselves, mainly because Im no good at forcing poetry or waiting for the end to come to me! Inspiration is so often hard to come by, I myself have been struggling to find some inspiration, somewhere, anywhere. I'm glad you could find some of your own! You're kidding, MOI! You have another song? Wow, you've really been hiding away, haven't you! We all knew you were talentented, but not how much!! You know what's really cool? I opened my page, and opened a new tab into yours, so both were running simultaneously... and guess what - if you want to hear your song in a round - it's great! Thanks to Tor from Norway, I have found this exceptional post and poem/song. I "ditto" everything he said in his own comment. This really does touch the soul. MY soul. Thanks for all the work it took to get it up here! Steve: Thanks, Steve! Uh...I guess Annelisa's need for sleep is holding us up! You'll just have to stay tuned to hear the next one and see new footage from England. It IS pretty neat team work isn't it? Toraa: Wow! I'M overwhelmed by your glowing compliments. Thank you so much! A fan all the way from Norway! I am glad you were so touched by this song. I'll link you too! Barbara: Thanks so much. Ypu tested the waters! I am thrilled that such lovers of music like you and David have song on your i-pod and actually listen to it! Frolicsome Kid: Thanks! We could all open it at the same time and have a blogger sing-a-long!! WAY cool! Mystic Rose: The wonders of the internet still amaze me! Thanks so much...you're right it is a pretty simple but with some depth too. Annelisa's video was perfect! She captured the mood and pace, matching the song totally! Meno: I knew you wouldn't be quite speechless! Thanks very much. I've been sitting on this one awhile as you can see by the date. But as always, I need tech help from someone...Annelisa was a persistent producer! I hadn't even thought of putting it to a video. Check out her site.it's full of wonderful shots! I call her, "Sky Girl"! Water Baby: Thanks, WB! I'm glad you came by for a look and listen. It's so neat to get a young person's opinion and extra cool that your dad likes it too! Hope you get some inspiration soon. Look how simple mine was in this case...just from what one person threw off in their chatter! It'll come. Keep blogging! Annelisa: NO JOKE! I do have another well, actually 2, but the 2nd is a kid's short response song to the first, which is one from teachers to parents. I'll send you the words sometime soon. I haven't got the music on my computer 'cause GUESS WHAT? someone did it for me for this one and I don't remember what she did! The dubbing over did that on my computer too the first time but I have no idea how!! It comes on automatically when you go to the post, right? Then, I think I clicked on You-Tube a few seconds later! Interesting effect, but I like it better with just one track! NEW TAB??!! You're a genious! I have NO IDEA what this means!! Hard to believe as it is! Ginnie: I was just commenting and it wouldn't go up and I'm glad I caught yours in between! Guess it was waiting for you! Thanks very much for the visit and lovely comment! I've seen you on many blogs I read...Renny...Colleen, I think, too! I'll come by yours soon. So glad you liked my song. Wow! Impressive!!! It's great to actually hear your voice (in a new way). Annelisa: Cool, but I don't have it! I e-mailed a bunch of friends and I'll forward you the comments on your video! So far they've been excellent! Bobealia: Hey, thanks for tuning in! And for the nice comment! Ruth, that is fantastic! Your voice sounds wonderful... overall a great song. You obviously have lots of talent. Congratulations, and keep up the good work!! Excellent song and video! Good job, both of you! I can't believe Annelisa has actually got me listening to your song twice.. simultaneously! Not that it's any hardship to listen. It makes a difference seeing the words written down for me - I'm very guilty of listening to the music and ignoring the lyrics of songs... I'll try harder! Went to Bill's website - the music's great... Cheers for the link. where have I heard the song before? Look forward to seeing the emailec comments! Back tomorrow... (((Big hug))) - you did great! MOI! I played it over and over until I could sing along with you! What a mavelous song! What do you mean you can't write poetry? What an absolutely lovely use of talent and technology. And after a long day, to hear such an honest and hopeful voice. I'm so pleased that I finally wandered over from Pauline's blog. Wow! It's so nice to hear your voice. What a wonderful expression. The funny part was I clicked on Utube while the song here was playing and they played together! Alda: Thanks so much, Alda! A high compliment for one who is such a fan of music! Grizzbabe: We both thank you for "tuning in" and for your nice compliment! Top Champ: Interesting effect, eh?Yes, I know what you mean about not focusing on lyrics...that's partly why I included them. I should try to catch more lyrics when listening to songs. Thanks so much for checking out Bill's site! Quasar9: Thanks! Hmmm..does it really sound familiar? Bill says sometimes we unknowingly, slip liitle bits of what we've heard before into our own writing. One part sounds like a Ricky Nelson song but I don't know which one. Pauline: I'm so grateful for your comment and am so glad you "tuned in" and now know my song! We should have a blogger sing-along! HA! Shara: Thanks for the travel over from Pauline's and for the great feedback! It was a neat collaboration of 3 different people, their skills, and technology! Yes, I guess it is pretty honest and hopeful...have never heard that comment before! Colleen: Thanks, Colleen! You write such wonderful pieces that I am thrilled you like this mode of my expression. That effect was cool..both playing at once but did it play at the exact same time or was one lagging a bit? I still like it better just one at a time! Well done my friend. I am so jealous that you can sing! My voice sounds like an alley cat singing in the night! Old Lady: Hey, thanks for comin' to my first concert! (And staying till the end!!) I'm sure you don't get shoes and hangers thrown at you at midnight! Glad you thought it was good. My computer is playing it really slow right now and I'm kinda sounding like some drugged cat after they've been spayed! Ann: Thanks for making the hike over here! Thanks so much for your comments. Ruth! What a truly lovely song and so beautifully performed. You are so very talented: The music, the lyrics, the singing. I listened to it a few times and now it's drifting around my consciousness. I think small Sara would enjoy it. I'll play it for her, too. Diana: I'm so glad you came and liked it! Thanks for your kind words...hope Sara likes it! My 2 fans that commented on You-Tube out of over 580 viewings are 16 and 17!! If they only knew an old lady was singing it! So cool! What a sweet, soft song and pretty lyrics. It is an honor to have your words put to music and this poem is very fitting. What a treat! Wow. If we could only come into wisdom without the pain of experience - but then it wouldn't be worth knowing, would it? This sounds like it could have been sung by by Peter, Paul & Mary - or some other folk-group. It has the flavor of those times. Brooksba: Thank you! I know you "get" a lot of my poetry and also that you love music! Glad you came for a listen! Fennymun: I am so glad you liked it! Thanks very much! Bob: Yep, you get it, but we have to learn all that the long way! And I'm a folkie but not quite that far back! My sisters were more of that time. Sanni: I appreciate you coming here to tell me that! Thanks! We had fun doing this! This is just incredible! So beautiful! And what a voice you have!!! Brava! I also am impressed with your voice! And jealous. I scare the neighborhood cats when I sing - heh. Lovely song. Toraa: I'm thrilled that you're thrilled! You're the first re-visit! Mona: Thanks so much for coming to listen and watch, and for your kind words! Maggie:I'm so glad you came to hear it and see the vid! Thanks for your nice compliment. My cat recognizes my voice when we play it! Of course, the name Ruth Lowe confuses me, because I am aware of another Ruth Lowe. Richard: Thanks a lot for listening and thinking it was lovely. Yes, I'm pretty soft voiced and quite folky but I like funky stuff too, I just can't sing it! Wow! Another Ruth Lowe? 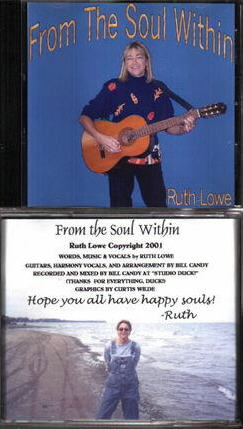 I know of one (Ruthie Lowe) but she died about 5 years ago. She wrote, "I'll Never Smile Again" and Benny Goodman's band did it in the 40's. A Jewish tailor in Toronto told me that and he didn't think I'd know her but I did...only because I used to play trombone in the Dance band in High School! That's funny because at the time, I wouldn't have known I was to marry a "LOWE". Nice job Annelisa did on the production of the video for YouTube. It is so nice to hear a Canadian voice singing a folk song we can all identify with. Your poem is really really great. So glad you had a chance to listen and watch. Thanks very much for your nice comments! I had a friend once tell me that my voice sounded eerily like it came from another place, not in this world...which spooked me a little but if it's an angel, that's not so bad! Yeah, we Canadians are real Folkies, eh?! Great song! and vid too! You have such a lovely voice!!! I had no idea! A sweet song... well-done, Ruth! Coll: Thanks so much! When I hear it, I always think it's someone else! Tinna: Hey, thanks! And we both know who was responsible for getting this post up! Your mom's the best! Naked Tapdancer: Thanks! I'm so glad you came to my "one song concert"! I know you see many music performances in your career so this praise is so appreciatied! Hope you like blogging with your new look! I'm not sure how I got here, but I've listened to the song four straight times, and it sure sounds good to this old folkie who grew up in Boston with JT, Bonnie Raitt, and Tom Rush as part of the local landscape. PS. Looking at the lyrics, you've got the classic ballad stanza...iambic tetrameter (trimeter in some 2 and 4 lines), ABCB rhyming. Maybe that's why it sounds so classic. Paul: Don't know how you did either but I'm glad you went to this song! It was my first ever.just putting a poem to music and tweaking it and adding the bridge in the middle. Ready to put it in the sidebar yet? That's a great song! Sounds very sixties and folky. You have a very simple, soothing and wise voice. This song is my favourite, but it's time for something new...check out "Watching them Grow" & "The Seeds You Sow"
HA! That comment caught me off guard...thought it was another one from VIAGARA!!!! That's all I get now! OKay...no rush, all in good time!